All around Lochter Fishery at Oldmeldrum the combine harvesters have been sweeping up the winter barley and this has released thousands of black harvest mites. For the trout in the 3 lochs this is like manna from heaven as they have been seen ploughing along the surface greedily scooping up mouthfuls of this protein rich delicacy. However it did make the fishing a “mite” frustrating as anglers tried to work out how to imitate this surface phenomenon. It would appear from the returns book that small black dry’s and buzzers were the best option. Steve Prince form Oldmeldrum using small buzzers and small nymphs managed to land 15 fish for a very successful day session. 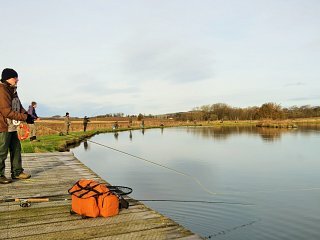 T Teil from Aberdeen netted 12 fish on black buzzers, Tom Murray from Edinburgh did well landing 10 fish on black spiders and other assorted dry’s and Charlie Miller used both white and black buzzers to bring a fish to the net. Other notable efforts were Mike Frost with 19 on a shipman’s buzzer and Nathan Hutchinson from Dyce with 11 fish on hot spot nymphs and Les Greenlees with 11 fish on a cat’s whisker. There have been plenty names already for the September Singles Competition which is being held on Sunday 17th September. Contact the fishery on 01651 872787 if you want to secure your entry to this popular event. With the harvest set to continue for the next week then this should ensure there will be a continuing supply of fly life to keep some good top of the water sport going.